listen); Occitan: Engoleime (standard) or (locally) Engoulaeme) is a French commune, the capital of the Charente department, in the Poitou-Charentes region of southwestern France. Located on a plateau overlooking a meander of the Charente River, the city is nicknamed the "balcony of the southwest". The city proper's population is a little less than 50,000 but it is the centre of an urban area of 110,000 people extending more than fifteen kilometres from east to west. Nowadays Angoulême is at the centre of an agglomeration which is one of the most industrialised regions between Loire and Garonne (the paper industry was established in the 16th century, a foundry and electromechanical engineering developed more recently). It is also a commercial and administrative city with its own university of technology and a vibrant cultural life. This life is dominated by the famous Angoulême International Comics Festival that contributes substantially to the international renown of the city. Basseau is a distruict which was created in the 19th century with the port of Basseau, the explosives factory in 1821, the Laroche-Joubert papermill in 1842, then the bridge in 1850. The old part of the city is built on the plateau - a rocky outcrop created by the valleys of the Anguienne and Charente at an altitude of 102 metres - while on the river bank the area subject to flooding is 27 metres high. Angoulême is characterized by the presence of ramparts on a cliff 80 metres high. The plateau of Ma Campagne, south of the old town, has almost the same features and peaks at 109m in the woods of Saint-Martin. The plateau is elongated and separates the valleys of Eaux Claires, which is the southern boundary of the commune, from that of Anguienne, which is parallel. Since Roman times ramparts have surrounded the Plateau of Angoulême. Repeatedly destroyed and rebuilt their reconstruction was finally stopped in the 19th century. The Ramparts are classified as historical monumentsTemplate:Mérimée Icon and the Ramparts Tour is one of the main attractions of the city. The climate is oceanic Aquitaine and similar to that of the city of Cognac where the departmental weather station is located. It was an alteration of In collisnâ meaning "on top of the hill" but a toponym is never formed from the Latin preposition in. As for the French word colline (hill), it was borrowed from the Italian collina at the time of the Renaissance (attested for the first time in 1555). In addition the suffix -isnâ was not used to produce derivations from Latin words and it is doubtful that it even exists. Finally, independent alterations of regular phonetic changes occur as a result of analogy or more precisely of popular etymology: that is to say analogy with other similar and frequent used names in the region or an attempt to connect the toponym to a term that makes sense. It is clear that the old forms of Angoulême are mostly obscure. The district of Bussatte take its name from the Low Latin buxetta / buxettum which means "place planted with boxwood" equivalent to Boissay in the langue d'oïl. The town was not located on major roads and was considered by the poet Ausonius as a small town. No Roman monuments have been found but it benefited from the Pax Romana and from trade on the river. The town had a prosperous period at the end of the Roman Empire. The rocky promontory overlooking the Charente 80 metres high and over the Anguienne 60 metres high formed a strategic position. It was raised to the rank of capital of civitas (at the end of the 3rd or 4th centuries) and the first fortress dates from the end of the Roman Empire. The rampart called Bas-Empire which surrounds 27 hectares of land was maintained until the 13th century. The network of Roman roads were then reorganized to link the town with the surrounding cities of Bordeaux, Saintes, Poitiers, Limoges, and Périgueux. The first bishop of Angoulême was Saint Ausone of Angoulême in the 3rd century. The administrative importance of the city was strengthened by the implementation of a County in the 6th century with Turpion (or Turpin) (839-863), adviser to Charles the Bald. However, the town was always attached to the various kingdoms of Aquitaine and the end of antiquity for the city was in 768, when Pepin the Short defeated Hunald II and linked it to the Frankish kingdom. It was this feat that earned him the name Taillefer, which was borne by all his descendants until Isabella of Angoulême who was also known as Isabelle Taillefer, the wife of King John of England. The title was withdrawn from the descendants on more than one occasion by Richard Coeur-de-Lion then the title passed to King John of England at the time of his marriage to Isabella of Angoulême, daughter of Count Aymer of Angoulême. After becoming a widow, Isabella subsequently married Hugh X of Lusignan in 1220, and the title was passed to the Lusignan family, counts of Marche. On the death of Hugh XIII in 1302 without issue, the County of Angoulême his possessions passed to the crown of France. The English were, however, expelled in 1373 by the troops of Charles V who granted the town numerous privileges. The County of Angoulême was given to Louis d'Orléans who was the brother of King Charles VI in 1394 and it then passed to his son Jean d'Orléans (1400-1467), the grandfather of Marguerite d'Angoulême and François I. The Good Count Jean of Angoulême greatly expanded the County castle after his return from English captivity in the middle of the 15th century. Angoulême, the seat of the County of Angoumois, succeeded to a branch of the family of Valois from which came François I, King of France from 1515 to 1547 who was born in Cognac in 1494. In 1524 the Italian navigator Giovanni da Verrazzano returned from the Indies. He told François I he had discovered a new territory that he named New Angoulême in his honour. This area later became New Amsterdam then New York. During the first wars of religion the city took up arms: it was reconquered in 1563 by Montpensier. In 1565 Charles IX passed through the city during his royal tour of France (1564-1566) accompanied by the court. In October 1568 the city was taken by the Protestants under Coligny. The Das Reich division, which became tragically famous in 1944 during the Battle of Normandy, continued their "lightning war" by quickly moving to the Spanish border to quickly set the line of demarkation to cut France in two. Angoulême was located in the occupied zone under German authority and was the seat of the Feld Kommandatur. The border with the free zone, colloquially called the zone nono (non-occupied) passed about 20 kilometres east of Angoulême through the Forest of Braconne and split the department in two. On 8 October 1942 387 people of Jewish origin were arrested and deported to Auschwitz. Only eight of them ever returned. On 19 March 1944 allied bombing caused widespread damage and one casualty at the National Explosives factory. On 15 June and 14 August 1944, the railway station was the target of American Flying Fortresses that dumped a carpet of bombs with little damage to the Germans but killing 242 civilians, destroying 400 houses, and caused 5,000 disaster victims in l'Éperon, l'Houmeau, Madeleine, and Grand-Font districts. At the end of August 1944 the Elster column, which was composed of the remains of various German units and the Indische Legion, passed through the city without incident and withdrew. With a communal area of 2,185 hectares, the density of population is 1,940 inhabitants per km², making it the most densely populated city in Charente and the third most densely populated city in Poitou-Charentes after La Rochelle and Poitiers. It brings together nearly 106,000 inhabitants within an urban conurbation which extends over fifteen kilometres from north to south. Angoulême is the most populous commune in the department of Charente and is the third largest Urban Unit in Poitou-Charentes, ranking just after Poitiers and La Rochelle and ahead of Niort. The town has been closely associated with motor trials and racing. The Circuit des Remparts (see below) is held annually, one of the last such street-racing course in France, together with Pau (and Monaco). In addition to local heroes, internationally known racing drivers, such as Juan Manuel Fangio, José Froilán González, Jean-Pierre Wimille, Pierre Veyron and Maurice Trintignant, have been regular participants. The famous cars which they drove frequently are presented at the modern event. The hotel and restaurant trade receives a considerable boost from the races. 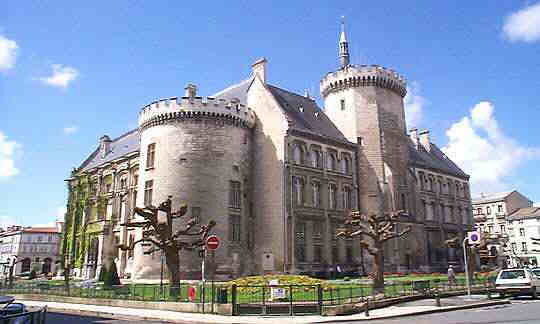 The Town Hall (13th century)Template:Mérimée Icon was designed by Paul Abadie and is a handsome 19th-century structure. It has preserved and incorporated two 13th century towers, Lusignan and Valois, from the Castle of the Counts of Angoulême on the site on which it was built. It contains museums of paintings and archaeology. The Ramparts (4th century).Template:Mérimée Icon The ramparts form a balcony overlooking the Charente. The Market building (1886)Template:Mérimée Icon is made of architectural glass and iron of Baltard type. The College Jules Verne, a former deanery, it has preserved the old chapel with beautiful stained glass and carved woodwork in the music room and a vaulted chapel with stone keystones and stained glass - visible from the Rue de Beaulieu - which has become the CDI. The Maison Saint-Simon in Rue de la Cloche-Verte (16th century)Template:Mérimée Icon built in the Renaissance style. The Hotel de Bardines at 79 Rue de Beaulieu (18th century)Template:Mérimée Icon is attributed to the Angoulême architect Jean-Baptiste Michel Vallin de la Mothe. The building is impressive in size. The Hôtel Mousnier-Longpré at 24 Rue Friedland (12th century)Template:Mérimée Icon was rebuilt in the 15th century. It has remarkable façades on the Rue de l’Évêché, Rue de Friedland, and the courtyard. The Place New-York. This square, formerly called the Park, was installed in the 18th century in the first real town planning project. It has remained a promenade and a venue for various events. In 1956 the square changed its name again. The City Council decided to call it the Place New York, in memory of the journey by Giovanni da Verrazano in the service of François I who, in 1524, named the site of the present New York: New Angoulême. The Place Bouillaud and the Place de l'Hotel de Ville. In addition to the City Hall there is also (in front of the entrance to the City Hall) a beautiful art nouveau façade. Angoulême Cathedral (12th century)Template:Mérimée Icon is dedicated to Saint Peter and is a church in the Romanesque style. It has undergone frequent restoration since the 12th century. It was partly rebuilt in the latter half of the 19th century by architect Paul Abadie. The façade, flanked by two towers with cupolas, is decorated with arcades featuring statuary and sculpture with the whole representing the "Last Judgment". The crossing is surmounted by a dome. The north transept is topped by a fine square tower over 160 ft (49 m) high. The Cathedral contains a very large number of items that are registered as historical objects. For a complete list including links to descriptions (in French) click here. The Church of Saint-André at Rue Taillefer (12th century)Template:Mérimée Icon has been rebuilt several times. The church contains a large number of items that are registered as historical objects. For a complete list with links to descriptions (in French) click here. A Lantern of the Dead in the cemetery of the Church of Saint André (12th century)Template:Mérimée Icon is actually a hearth - a remnant of the old Taillefer Palace. The Church of Saint-Jacques de Lhoumeau (1840)Template:Mérimée Icon The church contains a Gallery Organ (18th century)Template:Palissy Icon which is registered as an historical object. The Church of Saint-Martial (1849)Template:Mérimée Icon in Neo-Romanesque style by Paul Abadie. The church contains a large number of items that are registered as historical objects. For a complete list with links to descriptions (in French) click here. The Church of Saint Ausone from the same period and architect. The church contains a Statue of Saint Ausone (17th century)Template:Palissy Icon which is registered as an historical object. Another festival, small yet influential, is FITA, held each December. FITA stands for Forum International des Technologies de l’Animation, International Forum for Animation Technologies. The event was started in 1998. Some 250 – 300 French professionals from animation, effects, post-production and game development studios: SFX supervisors, head of studios, animators, technical directors, meet to share information and hear internationally renowned speakers on the latest advances and new ideas in entertainment technology. The Circuit des Remparts motor racing event, with its street circuit around the ramparts and past the Cathedral, is held the Sunday of the mid weekend in September. It is also the occasion of the world's largest gathering of pre-war Bugatti race cars, usually around 30 cars, many being examples of the legendary T35, the Ferraris of their day. British vintage and classic cars are also in attendance, most having been driven to the event. The Saturday of the "Remparts" weekend includes a tourist rally (as opposed to a speed event) for classic and sporting cars, around the Cognac area. Angoulême is the seat of a bishop, a prefect, and an Assize court. Its public institutions include tribunals of first instance and of commerce, a council of trade-arbitrators, a chamber of commerce and a branch of the Bank of France. It has several lycées (including the Lycee de l'Image et du Son d'Angoulême (LISA – High School of Image and Sound), training colleges, a school of artillery, a library and several learned societies. The market of Halles, or Covered Market. With its large roof and its late 19th century architecture, it has been registered as an historical monument since 1993. Isabelle Taillefer (1186-1246), known as Isabelle of Angoulême. The last descendant of the line of the counts Taillefer of Angoulême, she became Queen of England in 1200 through her marriage to King John of England. Jean d'Orléans (1400-1467), the "good Count Jean of Angoulême". Grandson of King Charles V of France, son of Duke Louis of Orléans and of Valentina Visconti, brother of the famous poet Charles d'Orléans and grandfather of King François I. Count Jean left memories of a wise man, educated and very religious. After 32 years of captivity in England, he settled in his county in Angoulême then at Cognac. At the end of the Hundred Years War he began works of reconstruction on his land. His popularity was immense hence the adjective "good count". He has been buried in Saint-Pierre d'Angoulême Cathedral for 540 years. André Thévet (1516-1592): explorer and writer, reported from Brazil: "angoumoisine grass" or tobacco, later introduced at the court of France by Jean Nicot. François Ravaillac (1578-1610): notorious for having murdered King Henry IV. François Garasse (1585-1631), author of The Doctrice curious wits of that time - or alleged so. Jean-Louis Guez de Balzac (1597-1654): writer. Marc-René de Montalembert (1714-1800): military man and diplomat, creator of the Foundry of Ruelle in 1753. Jean-Baptiste Vallin de la Mothe (1728-1799): one of the favourite architects of the Empress Catherine II of Russia, Saint- Catherine's Church, the Little Hermitage (now the Hermitage Museum) and the Imperial Academy of Arts of Saint Petersburg are among his masterpieces. André Guillaume Resnier de Goué (1729-1811): French general and one of the pioneers of aviation and gliding. Charles de Coulomb (1736-1806), French physicist, gave his name to the unit of electric charge. Cybard Florimond Gouguet (1752-1831), general of the armies of the Republic and the Empire. Jean Chemineau (1771-1852), born at Grelet, general of the armies of the Republic and the Empire. Besson Bey J.V. (real name J.V. Besson) (1782-1837) was, among others, an Admiral for Muhammad Ali, viceroy of Egypt. Octave Callandreau (1852-1904), French astronomer, native of Angoulême. Paul Iribe (1883-1935): designer and decorator French. He is considered one of the forerunners of "Art Deco". Paul Cognasse, (1914-1993), painter, glazier, and sculptor. Jacques Mitterrand, General of the Air Force and company director, born in Angoulême in 1918. René Chabasse, born 9 April 1921, killed on 21 February 1944 in Angoulême by a German soldier, a French resistance fighter. Dominique Bagouet, (1951-1992), French dancer and choreographer of contemporary dance. Claire Désert, born in 1967, pianist, professor at the Paris Conservatory (CNSM). Pierre-Jean Rémy (born Jean-Pierre Angremy 1937), writer, member of the Académie française. Saint Cybard (early 6th century-581): "deacon and recluse" in his own words, he died in the odour of sanctity at Angoulême. Lucien Loizeau (1879-1978), General, Military Governor of Metz, Grand Cross of the Legion of Honour. Lindsay Anderson (1923-1994), British film director, author of the film if.... (1969) which won the Palme d'Or at Cannes, died at Angoulême. René Olry (1880-1944) commanded the Army of the Alps during the French campaign from 5 December 1939 to 25 June 1940 - the date of the Franco-Italian armistice; died in Angoulême. Clair-Marie Fourcade, sport fishing champion of France, lives in Angoulême. Alain Renaud, musician, lives in Paris. ^ At the beginning of the 21st century, the methods of identification have been modified by law No. 2002-276 of 27 February 2002 , the so-called "law of local democracy" and in particular Title V "census operations" which allow, after a transitional period running from 2004 to 2008, the annual publication of the legal population of the different French administrative districts. For communes with a population greater than 10,000 inhabitants, a sample survey is conducted annually, the entire territory of these communes is taken into account at the end of the period of five years. The first "legal population" after 1999 under this new law came into force in 1 January 2009 and was based on the census of 2006. ^ "National Commission for Decentralised cooperation" (in French). Délégation pour l’Action Extérieure des Collectivités Territoriales (Ministère des Affaires étrangères). https://pastel.diplomatie.gouv.fr/cncdext/dyn/public/atlas/rechercheAtlasFrance.html. Retrieved 2014-11-07. ^ [[[:Template:Database Population Angoulême]] Census of population on 1 January 2006] on the site of Insee. Baynes, Thomas Spencer, ed. (1878), "Angoulême", Encyclopædia Britannica, 9th ed., Vol. II, New York: Charles Scribner's Sons . Chisholm, Hugh; Phillips, Walter Alison, eds. (1911), "Angoulême", Encyclopædia Britannica, 11th ed., Vol. II, Cambridge: Cambridge University Press . This page uses content from the English language Wikipedia. The original content was at Angoulême. The list of authors can be seen in the page history. As with this Familypedia wiki, the content of Wikipedia is available under the Creative Commons License.